U.S. markets settle mostly lower on heightened China/U.S. trade tensions while trading in less than a 1% range. News the U.S. would begin imposing a 25% tariff on an additional $16 billion in Chinese imports in two weeks weighed on sentiment. The mixed session showed some bullish signals as Tech closed higher and volatility settled lower despite the choppy session. The Dow dipped 0.2% after trading down 25,557 while snapping a 3-session winning streak. The blue-chips closed just below the 25,600 level but has wiggle room down to 25,400 before we can say a short-term top is in. 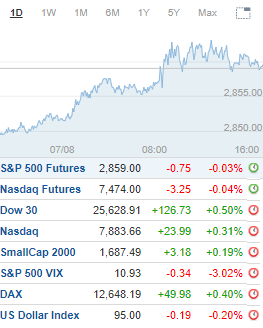 The S&P 500 was down less than a point, or 0.03% after trading in a 9-point range while snapping a 4-session winning streak. Support at 2,850 held on the backtest to 2,853. The Nasdaq added 0.1% to extend its winning streak to 7-straight sessions while trading to a high of 7,901. Lower resistance at 7,900-7,925 held for a second-straight session to give a slightly cautious signal. The Russell 2000 slipped 0.1% following the intraday pullback to 1,677. Support at 1,680-1,675 was split but levels that held into the closing bell. Technology and Financials showed the most sector strength after rising advancing 0.3%. Healthcare was up 0.2% while Consumer Discretionary climbed 0.1% to round out the winners. Consumer Staples sank 0.8% and was the weakest sector. Energy and Real Estate fell 0.7% and 0.6%, respectively.